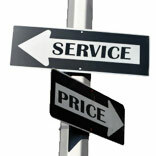 Price over service or vice-versa? Retailers are on a constant lookout for ways to attract potential customers and increase their existing footfalls. Do retailers actually know as to what constitutes a shopping experience for a customer? What is it that customers look forward to? There have been times when the 'Price' quotient ruled the retail scenario and at yet another time it has been 'Customer service' which has topped the charts. According to prominent industry experts, price and customer service are said to be two building blocks for retail operations. The present scenario implies the customer being caught between the two. Few are happy with the kind of attention they get at a store while others tend to give more importance to the price of a product. Customer service is something which can be described as the bloodline of a business whereas price point is something on the basis of which, any business runs and operates. When you walk in to a store you may be given an excellent customer service but probably with a price tag attached....Isn’t it? Justifying your pricing strategy is of prime importance. Pricing strategies don’t just involve the lowering of prices. Too cheap a price can make the customers think that you are less professional than the others. On the other hand, charging too much will lead people to think you’re too greedy. Having the right pricing strategy is significant since a small decrease can increase sales dramatically and a small increase can go unnoticed by your customers. There are many ways to price a product which includes different kinds of pricing. They are mainly – premium pricing, penetration pricing, economy pricing, price skimming, psychological pricing, product line pricing, optional product pricing, captive product pricing, product bundle pricing, promotional pricing, geographical pricing and value pricing. These are the methods which help a retailer to pursue strategies and policies in various situations. For those who can afford, they do not mind chipping out a few extra pennies in exchange for being looked after well while they are at a store. But for some, shelling out those extra bucks is a bit pinching to their pockets. They feel that if they can get an equivalent product at a lower price, they would save on the extra money. Value for money still holds relevance to them. Talking to a few more consumers produced a mixed response wherein a few wanted to be offered better customer service, while for some price was important. However, experts in the field feel that the orientation among Indian consumers (the masses) is more towards the price vis-à-vis service. “There are different types of Indian consumers and different types of purchases. One is the premium consumer, who is not much concerned about the price but very much concerned about the service. Such consumers shop for Louis Vuitton products. This category of consumer prefers 99 per cent service and 1 per cent price. On the other hand there is this mid-segment consumer that goes in for mixed purchases and shops at supermarket. This type of consumer focuses 95 per cent on price and 5 per cent on service. They are very much concerned about the price,” shares Harish Bijoor, CEO, Harish Bijoor Consults Inc.
A retailer can offer promotions and discounted price points to increase the inflow of customers at a store. It should also be understood at the same time that unless you can get some of those customers to come back to your store, your business won’t be profitable for long. What retailers need to do is find a middle path to catch a customer’s frenzy. Offering the best customer service at a competitive price is what they should strive for. By doing so not will they garner more sales, but it will for sure add up to their existing customer base as well. Retailers can get the act right by offering the right mix of pricing and customer service to the customers so as to send them happily and bring them back too.